Ultima Poker is a brand new independent online poker room that wants to conquer the poker world with new graphics, great offers, and maximum security. Although the poker room is new on the market, you will already find an amazing number of players at the tables. Their fantastic offers are constantly bringing in new players. New players get a lot of extra cash and tournament tickets to test the poker room. No Limit Holdem games are offered from $0.01 up to $10/$20. They offer all sorts of Sit & Go and MTT tournaments including Freezeouts, Rebuys, Deepstack, Turbo, Knockout and Bounty tournaments. In the tournament poker arena, the buy-ins range from $1.10 to $220. For the weekly special MTT tournaments, there are also different satellites as it is also at all other online poker rooms. Ultima Poker does not allow third-party software (Poker Tracker, Holdem Manager) and does also not allow session scripts in its poker room, so all players benefit from a very soft player field which is especially good for beginners. In addition, Ultima Poker’s Random Number Generator (RNG) has been tested by independent game system evaluators. ITech Labs found that the order of cards is unpredictable, unrepeatable and evenly distributed, guaranteeing that play is always fair. 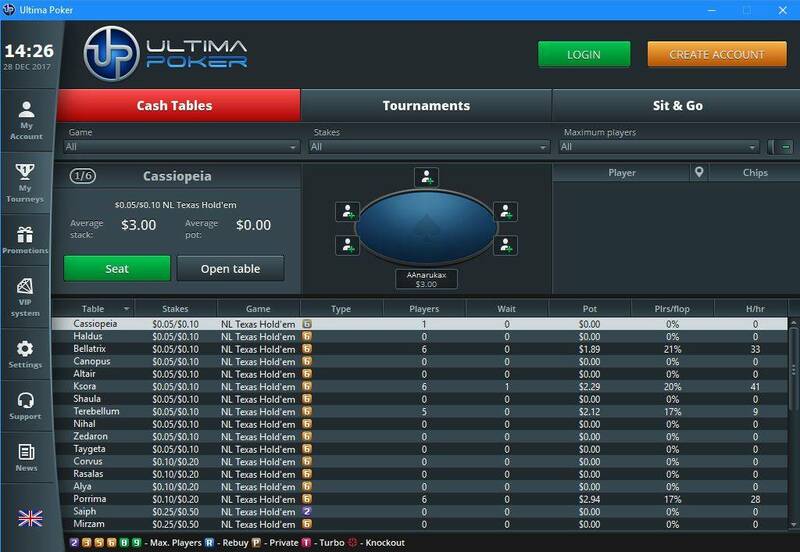 Ultima Poker prioritizes clean tables and fair gaming behavior from all players. Players who violate any guidelines are immediately removed from the games. Ultimate Poker hosts a variety of promotions for all players, including a $6,000 rake race for cash game players and a $4,000 rake race for tournament players. 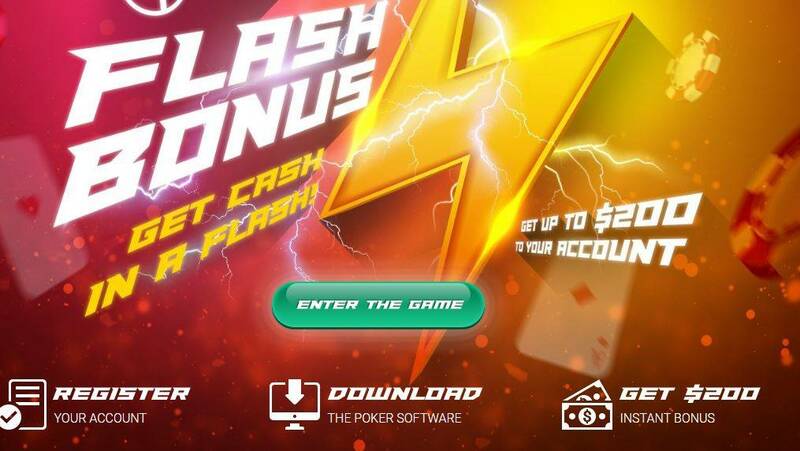 New players receive a deposit bonus of 400% up to a maximum $2.000. The value of the bonus is the equivalent of 20% rakeback and you have 90 days to clear this bonus. Through the Winter Promotion, each player receives a 20% cash bonus which is immediately credited to the player’s account, with a deposit of at least $ 100. The maximum bonus for this promotion is limited to $ 200- with a deposit of $ 1,000, you would be credited the maximum bonus of $ 200 cash. In addition, Ultimate Poker awards each player free tournament tickets. Each player making a deposit of $100-200 will also receive 2x $5.50 tokens for a tournament of their choice. For a $201- $500 deposit, you will get 2 × 11$ tokens, and for a deposit higher than $501, you will even get 4 × 11$ tokens. Players receive up to 40% rakeback through Ultimate Poker’s regular VIP system. The highest VIP status is obtained by making $ 8,000 in rake/fees. If a player can do this for 2 months at a time, he will even receive 100% rakeback next month! In addition, each player can receive extra rakeback through exclusive YourPokerDream promotions such as our $25,000 YPD Main Rake Race, Let’s go to Ibiza and more. Special VIP High Roller Deals are available! Contact our VIP support team below. The software is revolutionary and well-designed. It offers an incredible gaming experience in combination with stunning graphics, and runs stable. Ultimate Poker has a great mobile version for iOS and Android so you can enjoy the Ultima Poker action anywhere. Unfortunately, there is no Mac version available at the moment, but it is under development and will be available in the near future. All the known deposit and withdrawal options are available. Ultimate Poker accepts deposits and withdrawals via Bitcoins, which is not common in the online poker industry. 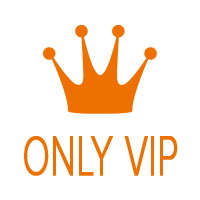 Payment processing is speedy- our players haven’t encountered any problems- all payment requests are usually processed within 24 hours. Ultima Poker has great, attractive promotions, a very modern and easy-to-use software, and a good customer service. YourPokerDream is convinced by Ultima Poker’s product, and expect that the provider has huge potential for future growth. 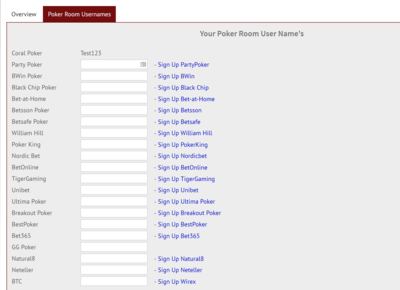 How to sign up correctly via YourPokerDream at Ultima Poker? Step 3: The register window is opening. Just follow the steps and press at the end then create my account. 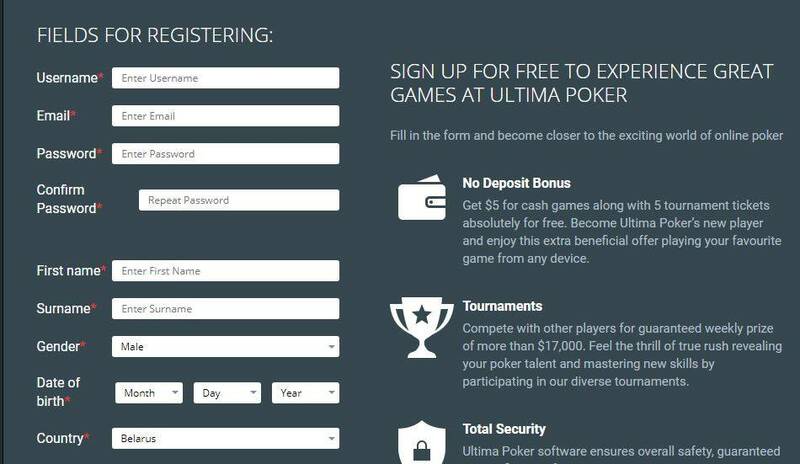 Step 4: After you’ve successfully signed up for Ultima Poker, all you have to do is log in to your YourPokerDream account and enter the username which you have chosen at Ultima Poker and press “save changes”. From this point on, everything will run automatically and you can use all exclusive offers from YourPokerDream in addition to the normal offers of Ultima Poker. Join our $25.000 Main Rake Race and receive some extra cash and nice Rakeback. All YPD Members with a tracked Poker Account participate automatically. Enjoy our First Deposit Bonus which provides 400% of your first deposit up to $2000. This generous offer will help you to play and win more taking advantage of all Ultima Poker benefits. Make a deposit at Ultima Poker and instantly get extra cash on your account. Do not waste your precious time – play for real money and get more. Qualify for this promotion by making a deposit from $100 at Ultima Poker and become utterly absorbed in the world of poker! You have 3 months to earn more rake points than others and get $10,000. The bottom line is to play more gaining more rake points. The most active players will share an enormous prize amounting to $10,000 of withdrawing funds. Ultima Poker encourages active players with rather generous rewards. Confirm Legend status twice and get 100% Rakeback during the whole month. Get VIP status which ensures 20-30% of rakeback for each player. 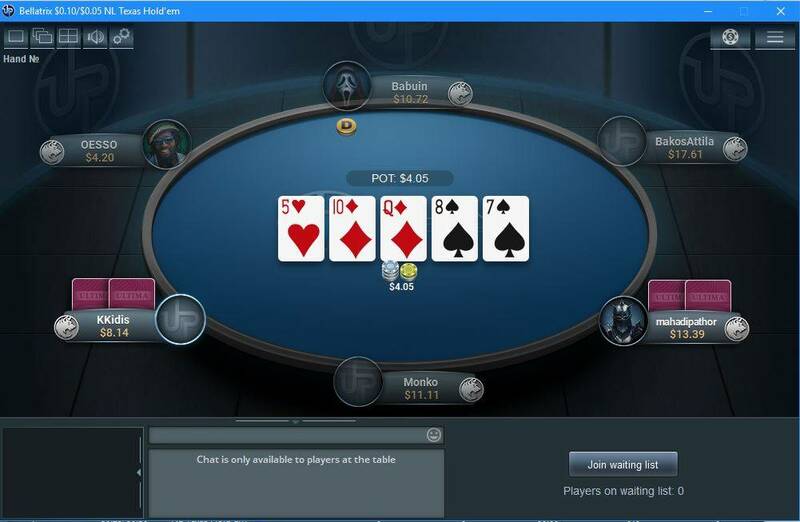 Ultima Poker players can immediately obtain it after depositing $200 at once.